Mmmm, pesto. I love the stuff. I had a batch in the refrigerator after hosting a pasta party with other popular sauces. I wanted to make something with the flavor of pesto, other than pasta or hummus, my two go-to recipes for pesto. We make a lot of patties in our house with a combination of whatever leftovers are in the fridge. This seemed like a yummy place to use my pesto. These come together quickly and are very little work. 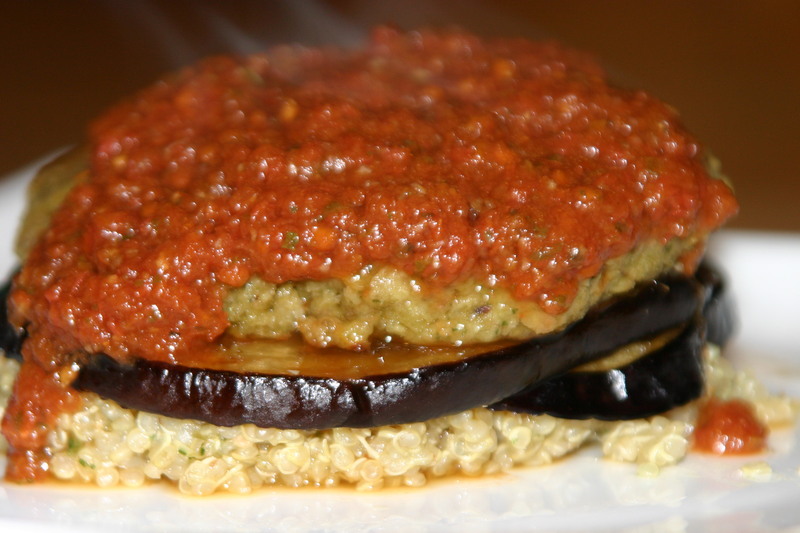 In the picture they are served with roasted eggplant slices, pesto quinoa, and marinara sauce. They would be good in many ways, so experiment. The one caution is to make sure you do not over-process these or the patties will be mushy. They will still taste good, the texture just won’t be super awesome. Place oats in food processor and process until ground to a flour. Add the rest of the ingredients and process until the mixture is starting to hold together, but there are still chunks of walnuts and garbanzo beans. Heat oil over medium high heat in a cast iron skillet. Shape mixture into patties and fry in batches, about 4 minutes on each side. This made 6 large patties for me. Slice eggplant in 1/8″ slices. lightly oil a baking pan with olive oil. Arrange eggplant slices in a single layer in the pan, and brush more olive oil over the tops. Cook about 30 minutes, flipping eggplant halfway through. Rinse 1 cup quinoa in a fine mesh strainer under cold water until the water runs clear. Place quinoa in a saucepan with 2 cups vegetable broth, bring to a boil, then reduce heat and cook about 15 minutes until broth is absorbed. Remove quinoa from heat and stir in 2 TBL prepared pesto if desired. Heat a jar of your favorite marinara.